Libyan demonstrators in Washington on Tuesday display the pre-Gadhafi Libyan flag. Washington (CNN) - The Obama administration is considering whether it should cut diplomatic ties with Libya, a senior U.S. official told CNN on Tuesday. "Whether to maintain relations or sever them is under review," the official said. Cutting ties would send a strong message that the United States no longer considers the government of Moammar Gadhafi to be legitimate. President Barack Obama and Secretary of State Hillary Clinton both said in recent days that Gadhafi has lost his legitimacy to rule the Libyan people and should leave power. According to the senior U.S. official, the last high-level communication with Gadhafi's government was last week, when Clinton spoke with Libyan Foreign Minister Musa Kusa. However, the official also said there was "still some utility" in reserving channels of communication with the Gadhafi government, noting that some American citizens remain in Libya and there could be a need to talk to Libyan officials about humanitarian activity. "There may be instructions one has to give to Libya depending on what happens going forward," the official said. The official added that the United States still considered Ali Aujali to be the legitimate Libyan ambassador to the United States, even after the Gadhafi regime notified Washington that Aujali no longer represented its interests. Last week, Aujali said he no longer represented the regime because of Gadhafi's brutal repression against the Libyan people. But he said he still represented the Libyan people and told the State Department he would remain a liaison to the Libyan opposition. 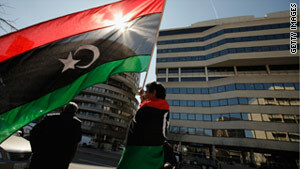 The U.S. needs to assist Libya unilaterally if necessary by military help. We could send drones overhead and take out the gov. tanks and anti-aircraft units. Then the A-10 Warthogs could finish off their tanks and armored vehicles making the fighting plane a little more even for the rebels. Our marines and army are not needed. One little assist like this and the gov. forces will go down like an elevator. Obama is not showing by following cameron into war. IF Britain has the money to go to war, let him, but not Obama, not should he go to war because Anderson cooper says so. USA should stay the hell out of Libya. Aren't we cutting milk for children and pregnant women in this country because we are broke? 100 billions a year in Afganistan and now Libya? You don't know what you are getting into: Libya is next door to Sudan, Tchad, Niger, all countries where you can know when you get in, but not when you get out. It's another imperialist scheme to control oil. America is losing to china, and want to control the middle east and Africa. Libya is one of the road blocks to such imperialism. THERE ARE 27 MILLION AMERICANS WHO ARE UNEMPLOYED. The entire population of libya is 6 million Most of the people in libya are people from Egypt 1.5 million, Tunisia 1 million, Americans, French, Greek, Turks, Indonesians and Africans, chinese and indians for the most part, working in Libya. IF the country was so bad, why would all these countries send their population over there if libya was such a bad place? I am surprised we haven't already severed diplomatic ties with Libya. Cutting diplomatic ties with Gadhafi's government could in the end be the best thing we could do even for the Americans who have chosen to stay despite the urging to leave. Perhaps cutting ties with Gadhafi might penetrate his delusional state.